When a group of con men pose as church elders to swindle a village facing destruction due to the building of a new dam, an earnest priest brought in to tend the congregation and a vicious local drunk find themselves caught up in the con men's game. This animated feature by Korean filmmaker Sang-ho Yeon is anything but a children's film. Absolutely brutal and relentless in its depictions of events, it shows no mercy in its gaze to anyone involved. As a comparison, think of The Fake's tone as being something like The Witchfinder General aka The Conqueror Worm, with a propulsive momentum closer to that of DOA. Given its themes, it's a film that straddles the line between the darkness of 40's noir and the overwhelming corruption of 70's political thrillers, while not exactly being either. The character animation is a bit crude at times perhaps, but appropriately so, and provides proper distance to view the characters without distraction that live actors might provide. There is little space for sympathy here as even the main protagonist is almost totally without the least redeeming quality save for his doggedness in pursuing the con men in part for revenge, but more just to prove everyone else wrong. 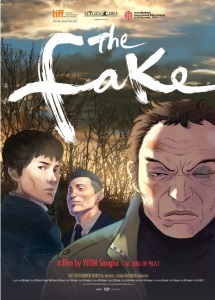 Although it was released in 2013, The Fake has some undeniable resonance with the recent corruption scandals in church and state which led to the impeachment of the South Korean president, Park Geun-hye, but the movie requires no knowledge of South Korean politics as the story is far more direct in its unfolding, almost to the point of being a deceptively straight forward narrative. I chose not to link to any pre-existing synopses or sites reviewing the movie due to most reviews oversimplifying the plot or concepts involved and eliminating the nuances involved. What makes The Fake so invigorating is how wholly encompassing its bleak worldview is, so reviews which suggest any narrower framing of the perspective seem to me to do a disservice to the movie. The Fake is unrelentingly bleak and the events portrayed warrant warnings for cruelty and abuse of many sorts, so it isn't a movie for everyone, but it isn't celebrating these things, so for those who find utter desolation bracing, The Fake is highly recommended, but for those who require some belief in moral goodness triumphing, this is probably a film to avoid. Here's the trailer for the film, which gives a glimpse of the animation, while not revealing anything of the plot. The trailer's really interesting in that it takes place before the events of the movie, so it is more setting the stage and hinting at the tone of the film than it is revealing anything about the story. The calm of the trailer acts as a kind of quiet prelude or overture to what will become an progressively more frenetic set of actions. It establishes a both ground for the setting that can be held against the feeling at the end of the film and adds an undercurrent of disquiet foreboding regarding the character we follow into town. So much more inventive and purposeful than the usual tendency to treat the trailer as almost a condensed version of the film showing the big action highlights. Sang-ho Yeon also made the well regarded 2011 animated feature, King of Pigs, about bullying in Korea, and, more recent, 2016, live action zombie film Train to Busan, which also has won some praise and has an animated prequel that was released at the same time, Seoul Station. I haven't seen any of these other movies yet, as zombies really ain't my bag, but it's an interesting body of work and I'm looking forward to seeing where he goes from here.